A well recognized craft from the Aizu region of Japan is the akabeko. Legend says the little red cow with the swinging head is based on a real cow or ox that lived in 807 AD. A monk named Tokuichi was supervising the construction of Enzo-ji; a temple in the town of Yanaizu. After the temple's completion, a red ox that had been used to haul timber to the site gave its spirit to Buddha, and its flesh immediately turned to stone. Another version of the story tells how the cow refused to leave after construction was completed becoming a permanent fixture at the temple. 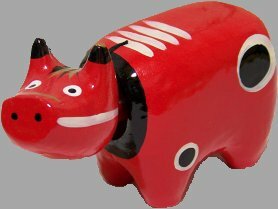 The red cow was called akabeko; beko is Aizu dialect for cow. During the same period, Japan suffered a smallpox outbreak and the people in Aizu noticed that children who owned akabeko toys were not stricken. The akabeko's red color may have enhanced this idea, since red amulets are thought to protect against the illness. As a result akabeko toys became very popular charms to ward off sickness. The toy has become a craft from Fukushima Prefecture known all over Japan and a symbol of the Aizu area. Last November Bobbie and I along with friends from work made a day trip to the Aizu area and one of our stops was Enzo-ji. It was cold along the banks of the Tadami River but the fall colors were wonderful.